The following links are to information about SAR and the America Revolution. If you reach a page that is not related, have a suggestion for an appropriate link,or experience a "dead link", please report it here. Bernardo de Galvez Chapter #1 updates this page often. http://www.sar.org/ - The National Society of the Sons of the American Revolution official web site. http://www.sar.org/hq/memberdatabase.html - The SAR Member Database. http://www.sar.org/membership/contact.html - The SAR New Member Help page. http://www.txssar.org - The Texas State chapter, SAR, home page. http://www.dar.org/ - The Daughters of the American Revolution official web site. 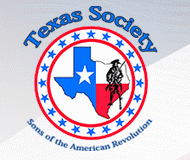 http://www.tsdar.org/ - The Texas State chapter, DAR, home page. http://www.americanrevolution.com/ - Comprehensive site with information on the American Revolution. http://en.wikipedia.org/wiki/American_Revolution - wikipedia information on the American Revolution. http://www.theamericanrevolution.org - Another very comprehensive site with information. http://www.usflag.org/ - Good site for history and information on the us flag. http://www.tsl.state.tx.us/ref/abouttx/flagcode.html -information on the Texas Flag.